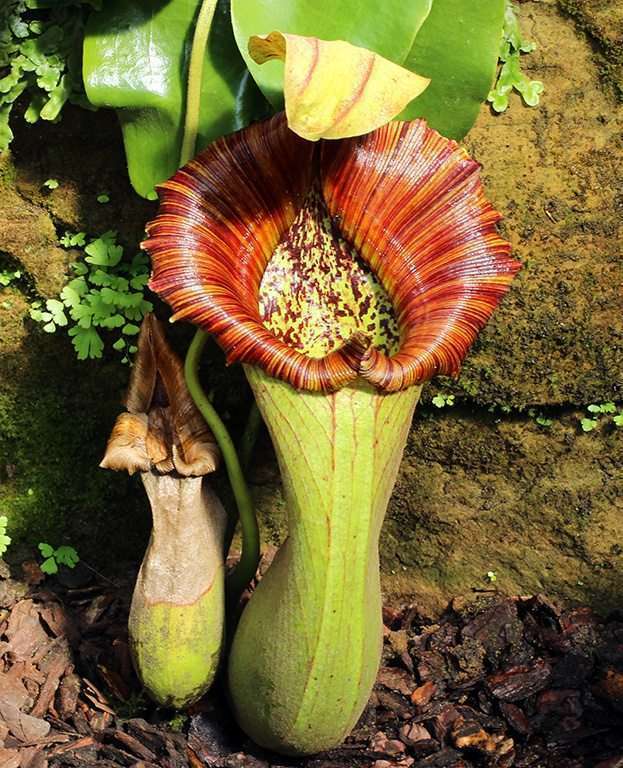 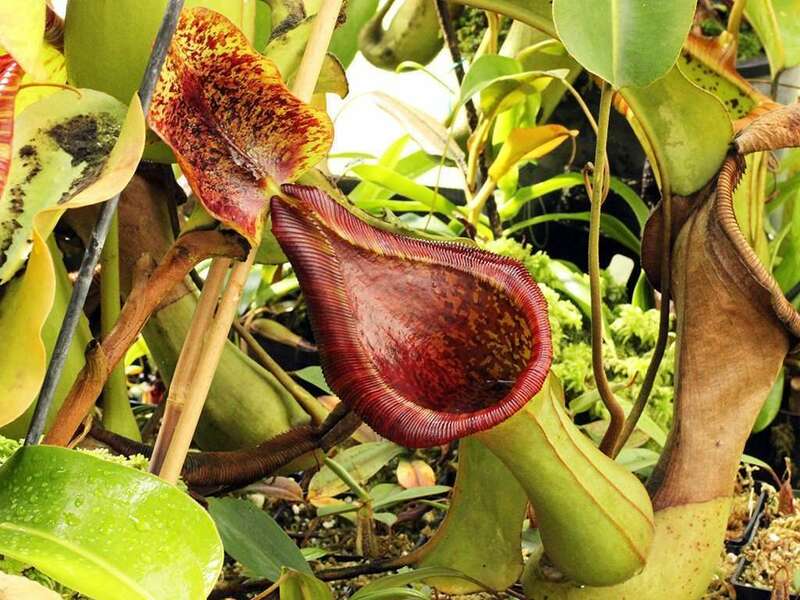 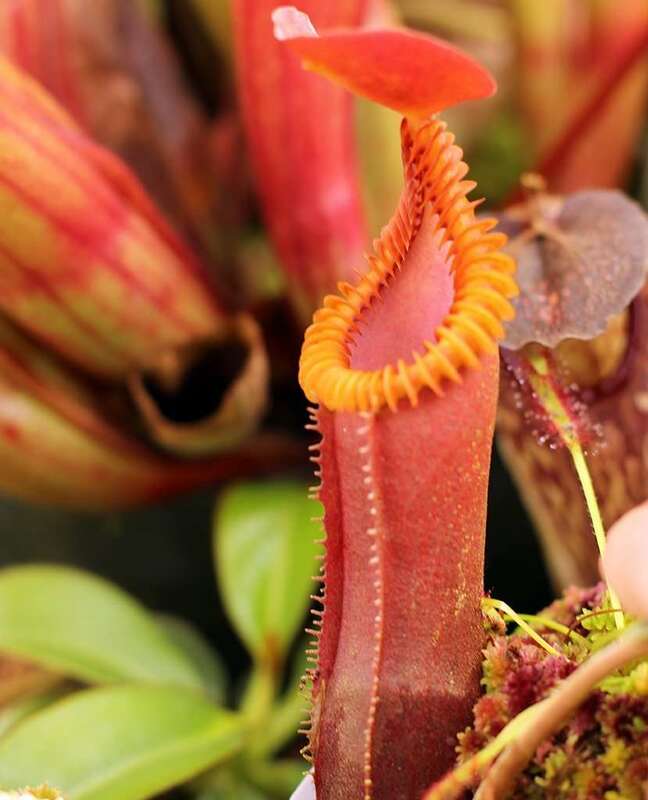 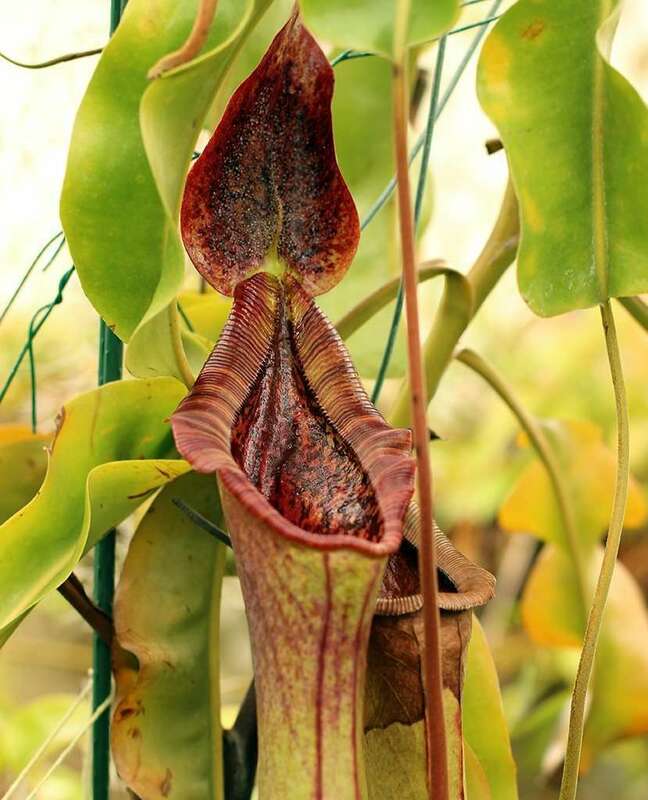 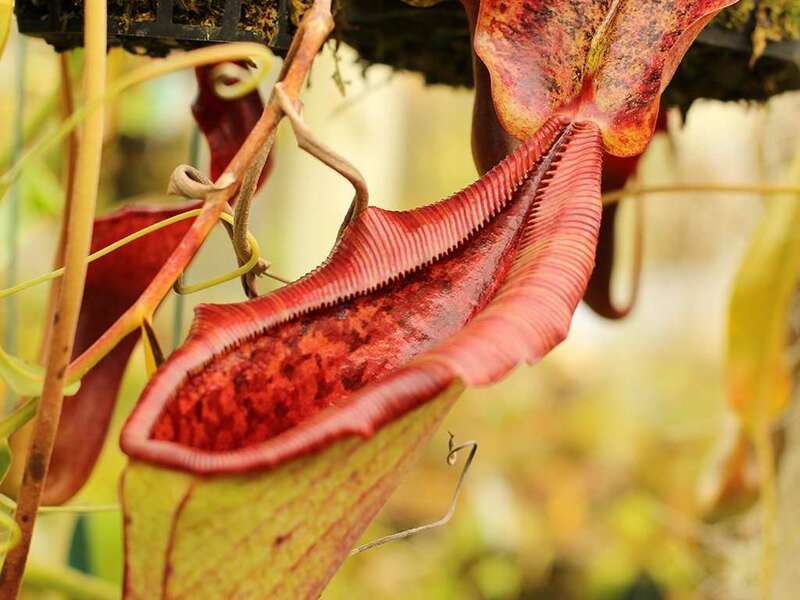 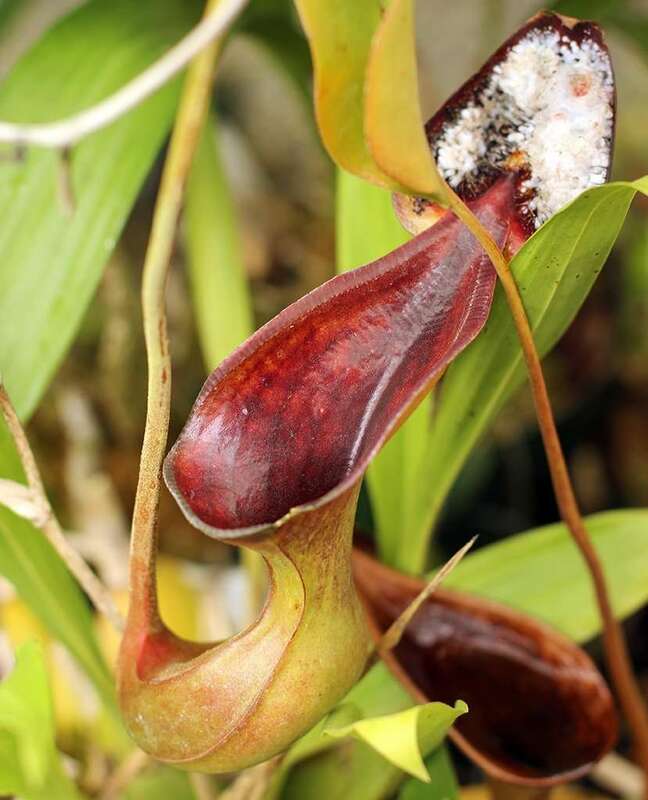 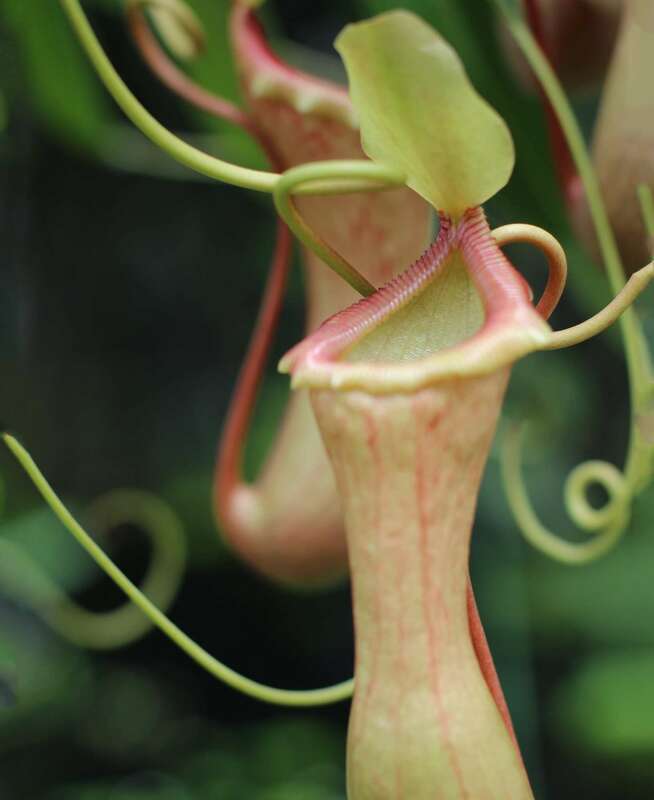 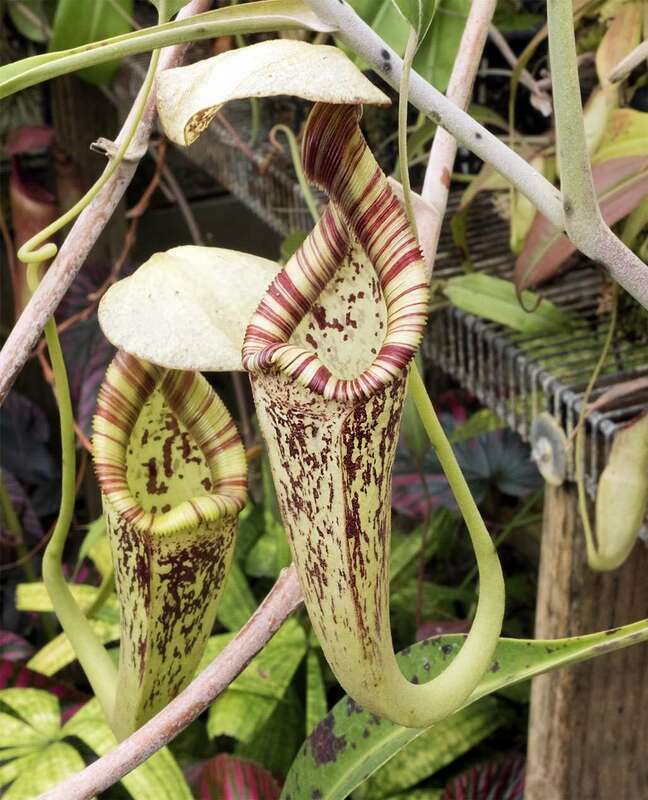 A beast of a tropical pitcher plant, Nepenthes lowii x truncata adopts the most remarkable characteristics of both parents – huge, peristomed N. truncata-esque pitchers and gaping N. lowii mouth and lid. 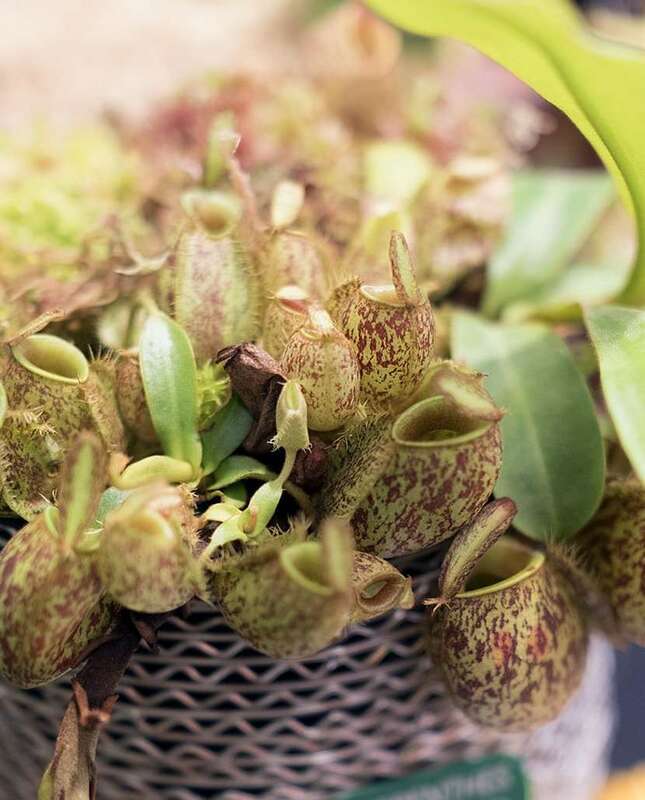 As many hybrids tend to be, it is remarkably robust, and does well as an intermediate plant. 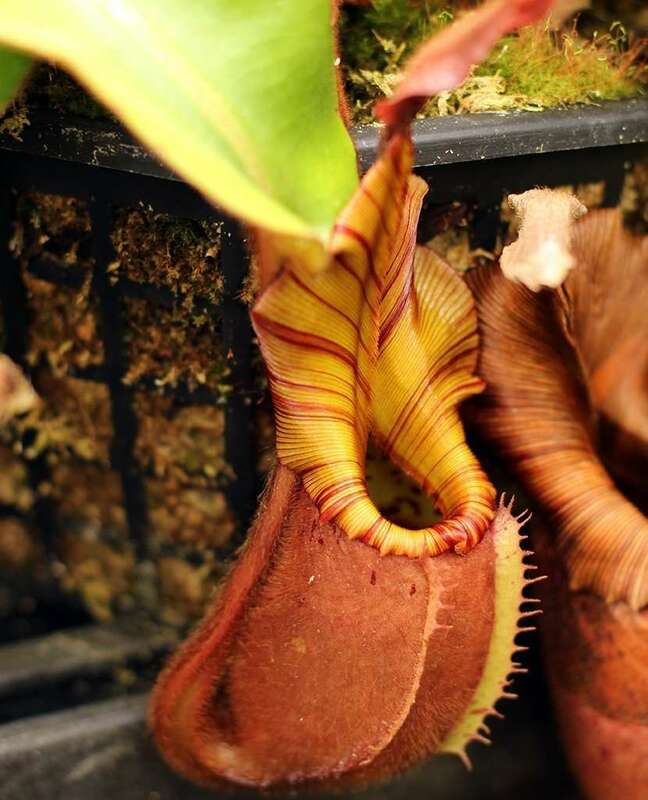 While you might be able to adapt it to windowsill conditions, I wouldn’t recommend it. 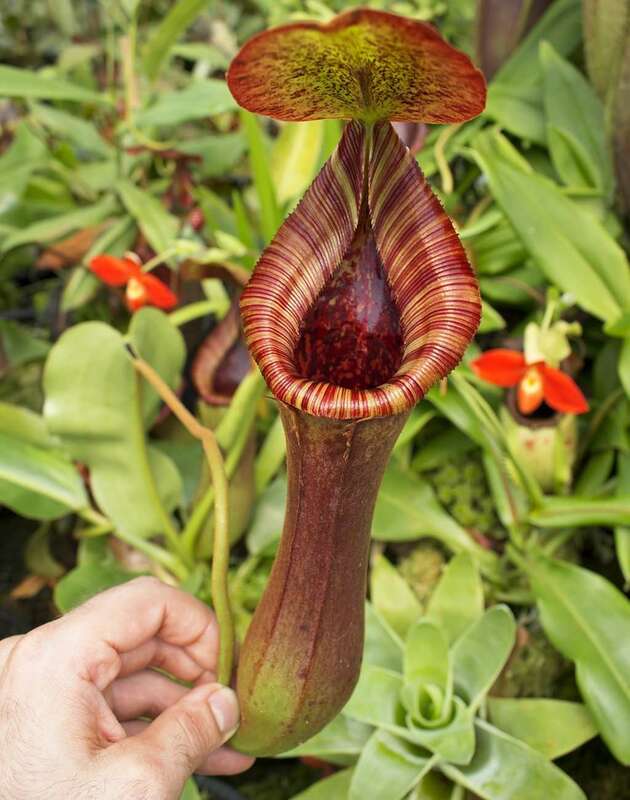 N. lowii x truncata gets massive and will take over any room when given tender love and care! 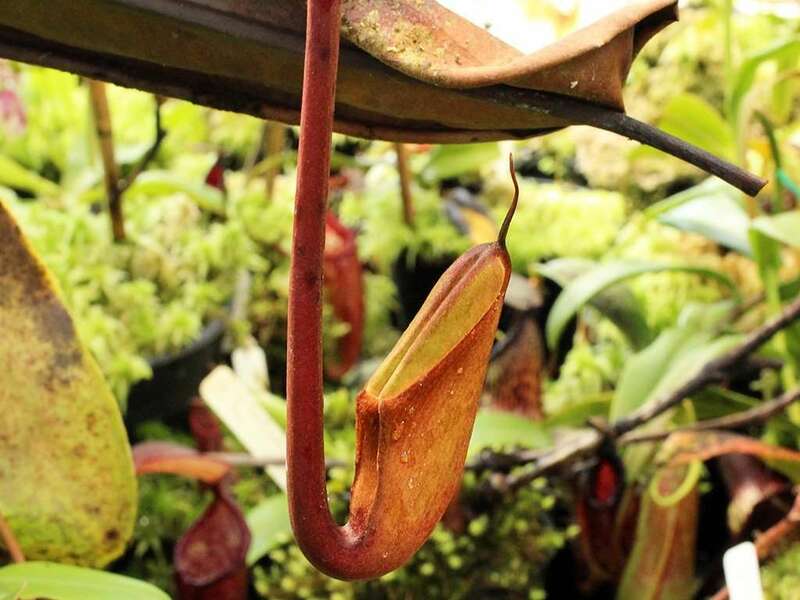 I’ve witnessed specimens clocking in at over 3 feet (1 meter) in diameter petiole-tip-to-petiole-tip. 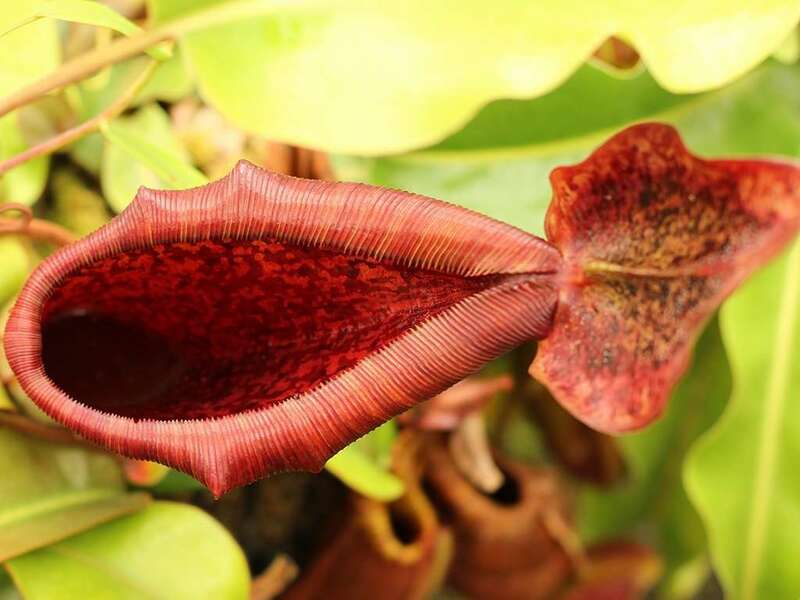 Nepenthes lowii x truncata is a manmade hybrid. 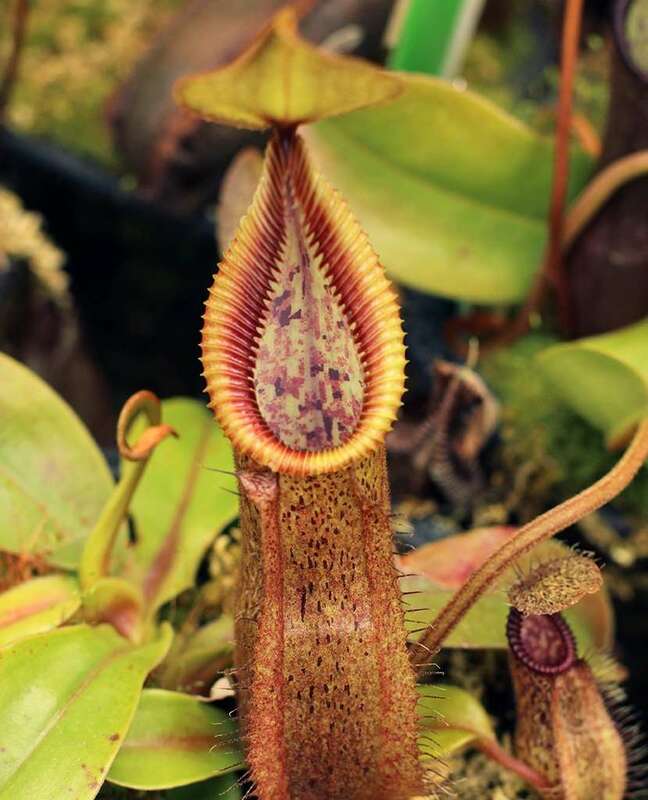 The parent plants don’t naturally come into contact in the wild, with N. lowii found on Mt. 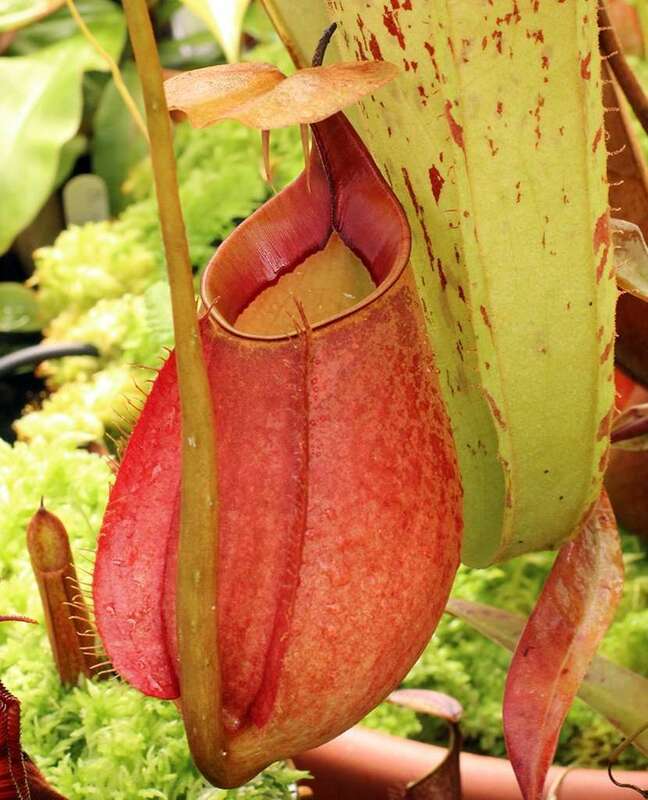 Kinabalu in Sabah Malaysia, and N. truncata on the islands of Mindanao, Leyte, and Dingat in the Phillipines. 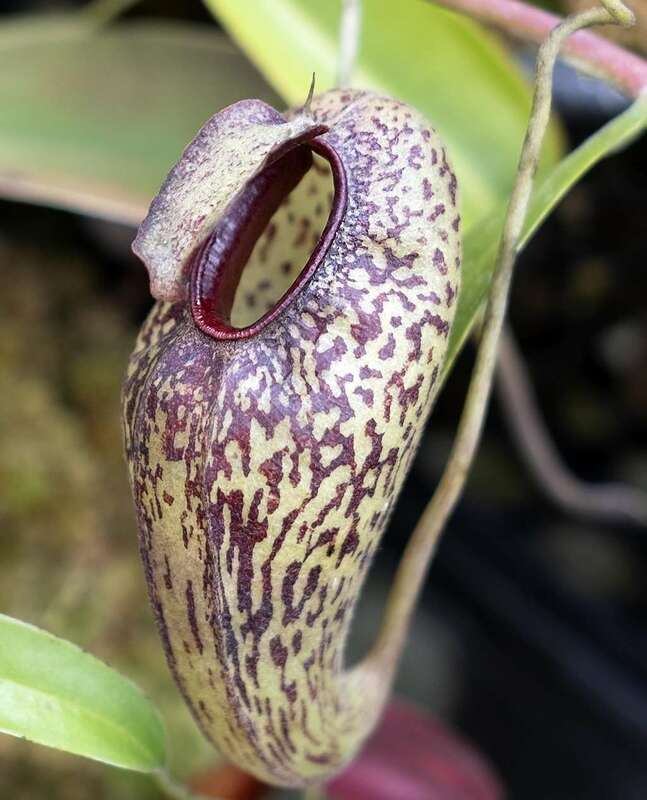 The original cross of N. lowii x truncata was created in 2001 and put on sale in 2003. 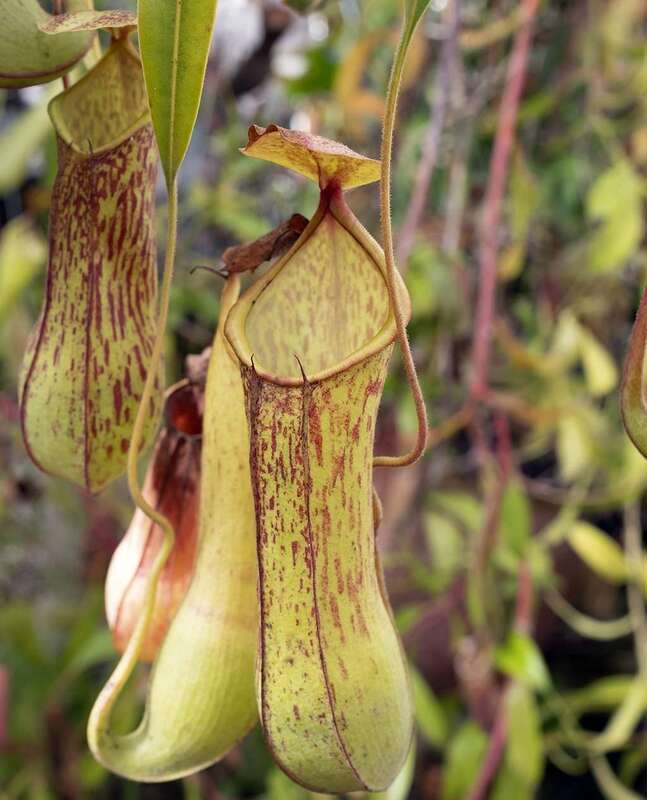 This batch of plants yielded N. lowii x truncata giant, a variant larger than the rest and only about 4 entered collections at the time. 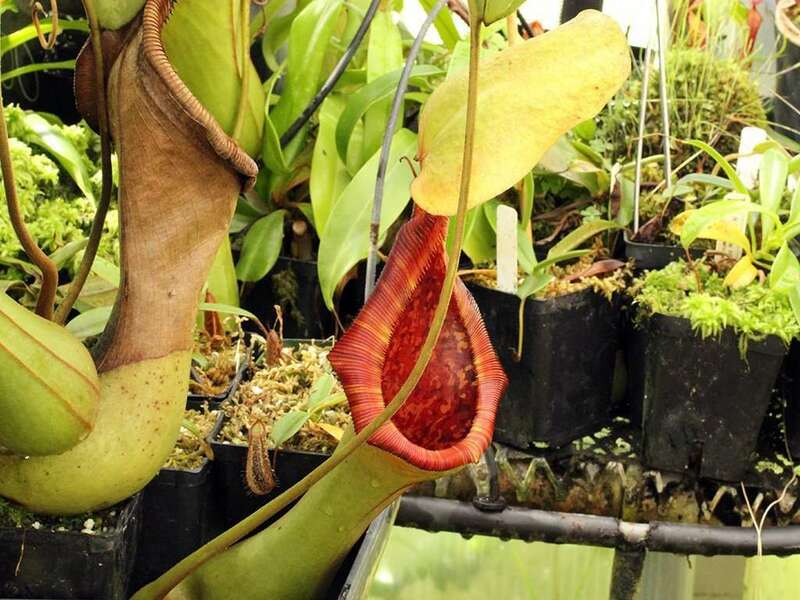 From there, N. lowii x truncata wide peristome and N. lowii x truncata squat were selected for. 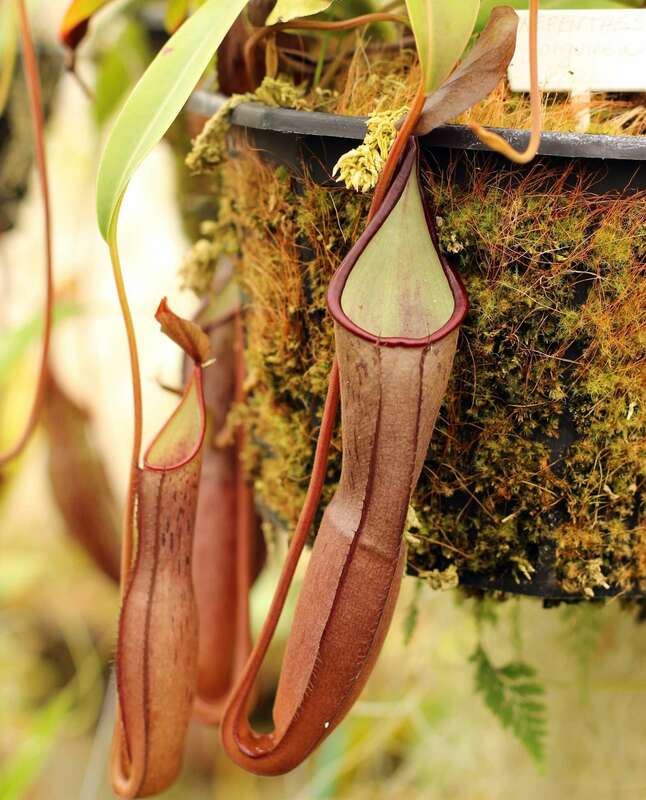 All of the variants are remarkable, and below you’ll find upper pitcher photos of N. lowii x truncata wide peristome. 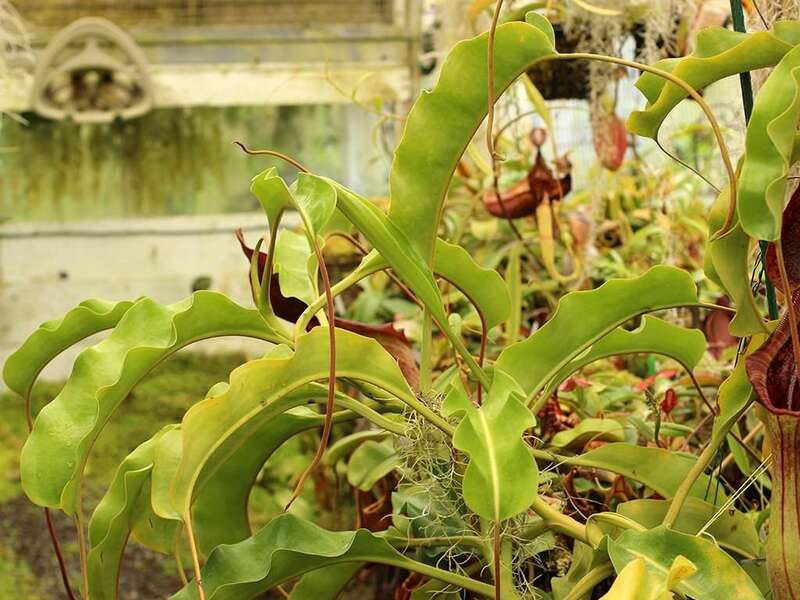 There is variation even among the specific large, wide peristome, and squat crosses with some plants producing deep purple lower pitchers and others producing green pitcher bodies. 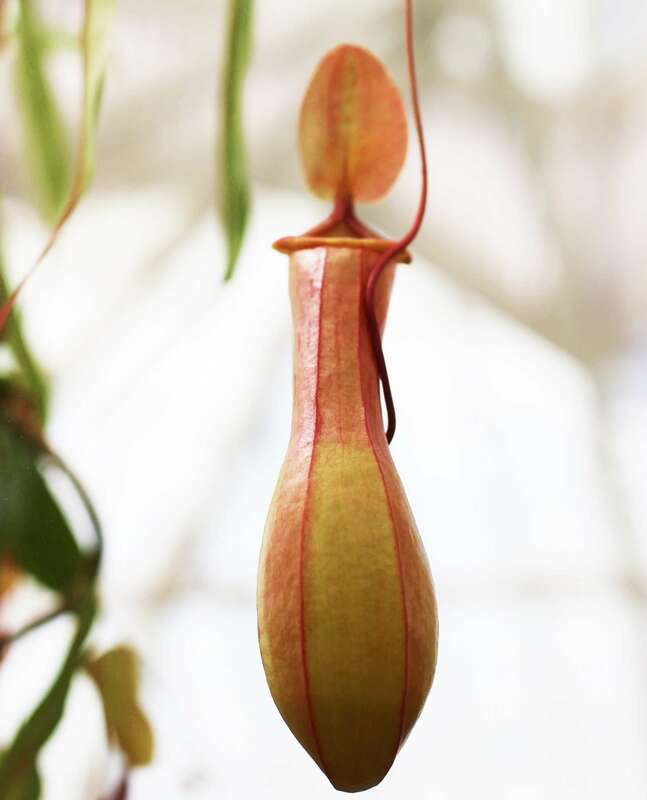 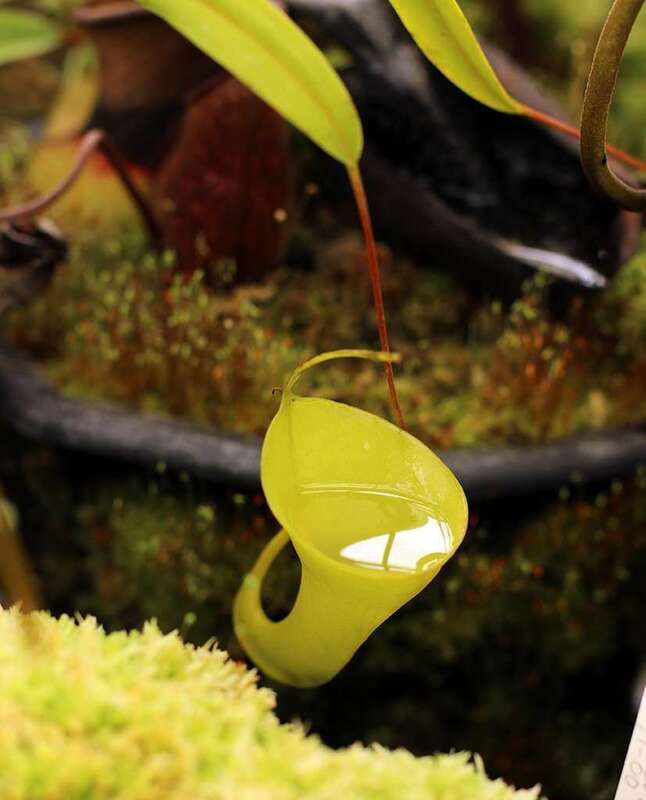 Upper pitcher shape of Nepenthes lowii x truncata is obviously an internal struggle between the oblong, bending N. lowii mother and the vertically oriented, ribbing of N. truncata father. 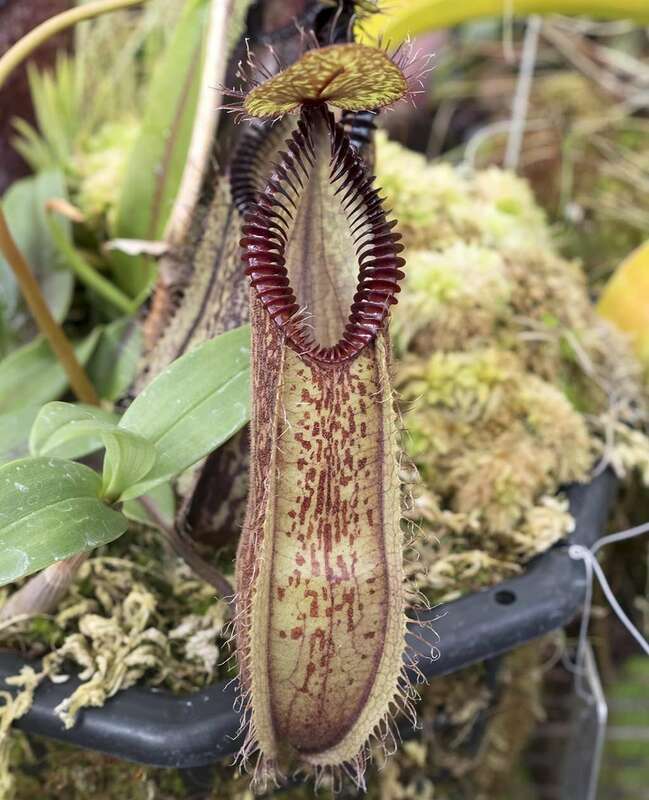 The pitcher mouth is oblong, tends to be more structured than pure N. lowii, and inherits a striped red peristome from N. truncata. 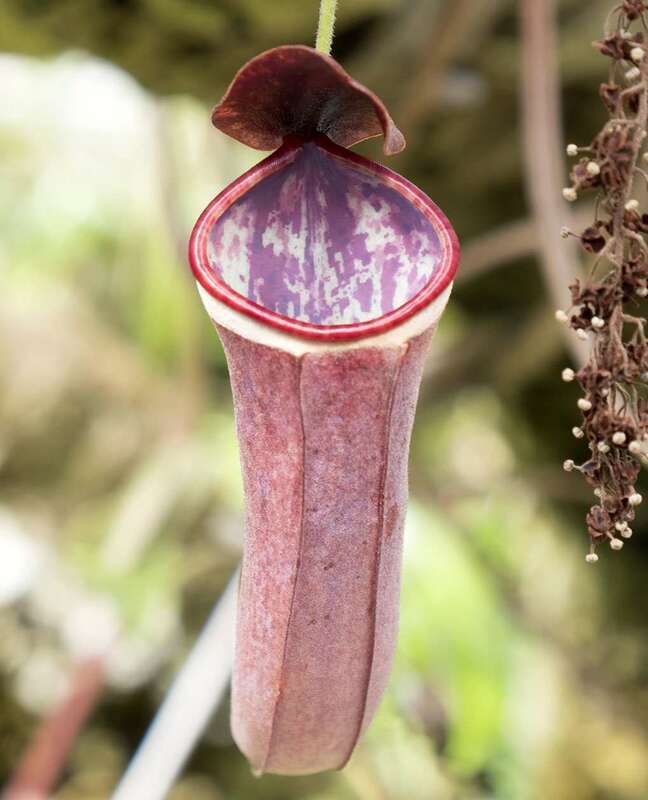 All plants produce a beautiful, deep wine red interior which begs prey to come take a closer look. 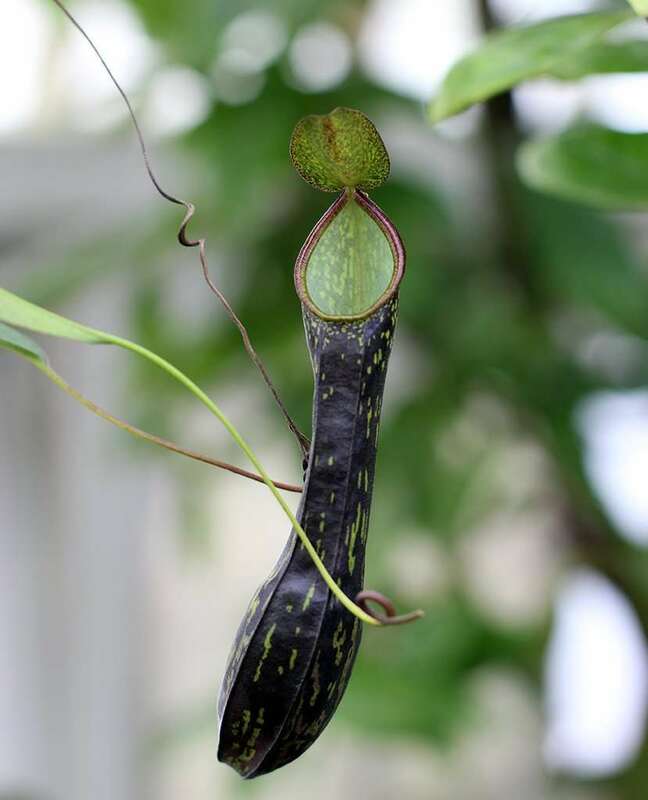 Like N. lowii, the plants produce the white snail-egg-looking exudate on the underside of their lids, though quantities seem to be reduced when compared to pure lowii. 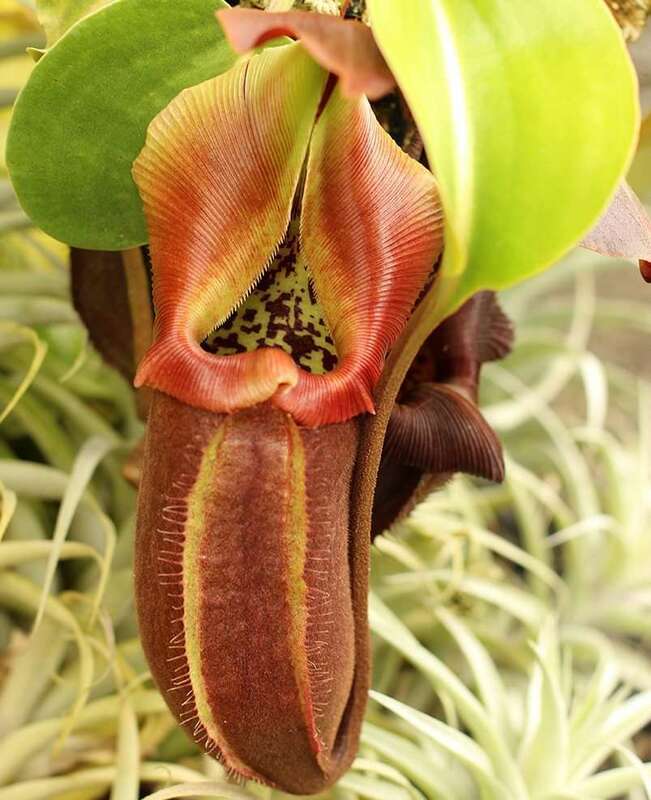 Underlid hairs are also produced, with some variants being fuzzier than others. 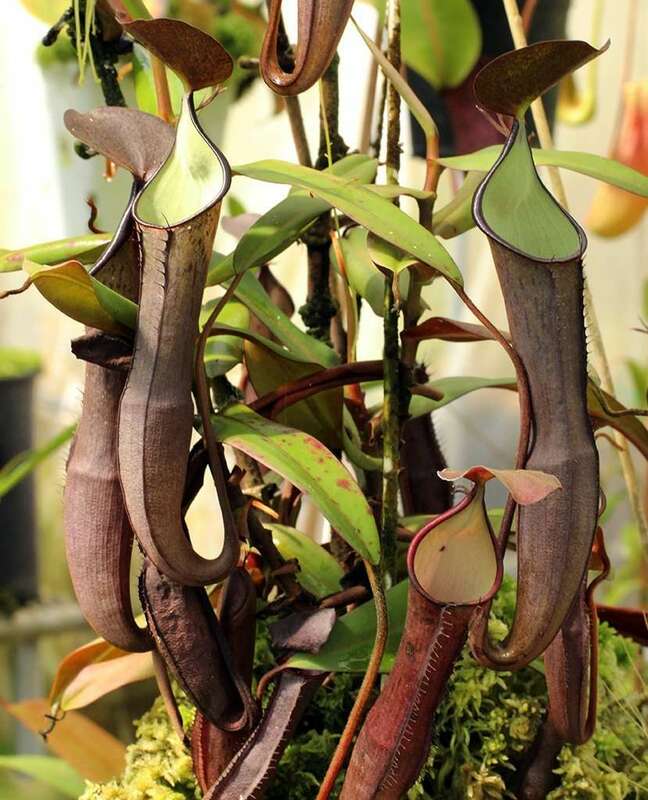 As with many Nepenthes, they respond well to light fertilization – even of the roots. 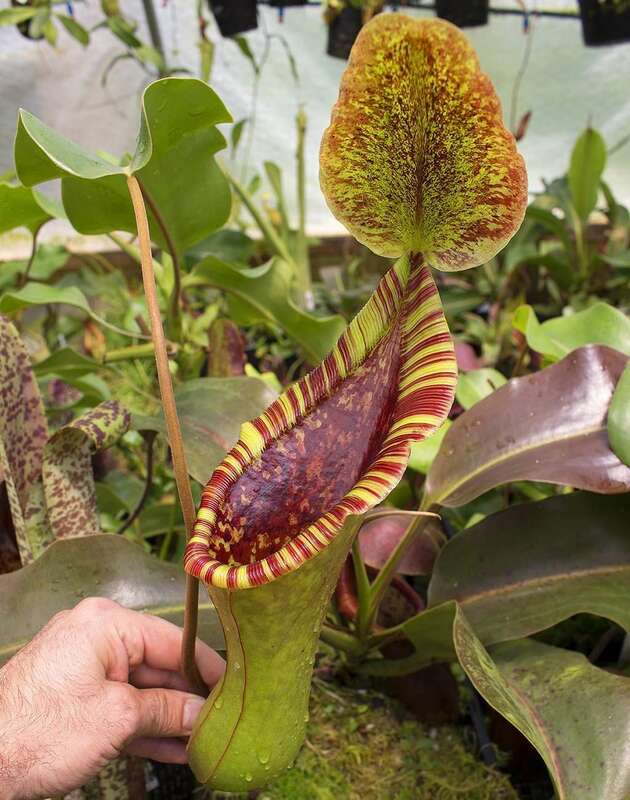 *Photos 3 and 4 featuring N. lowii x truncata ‘Giant’ and a lower pitcher of N. lowii x truncata ‘squat’ graciously provided by Domonick Gravine of Red Leaf Exotics!